In conjunction with the Paris Photo 2018 International Fine Art Photography Fair, Louis Vuitton Publishing showcased its catalogue of publications at a pop-up bookstore in the Grand Palais, located at the foot of the grand Stairway of Honor in the Nave. 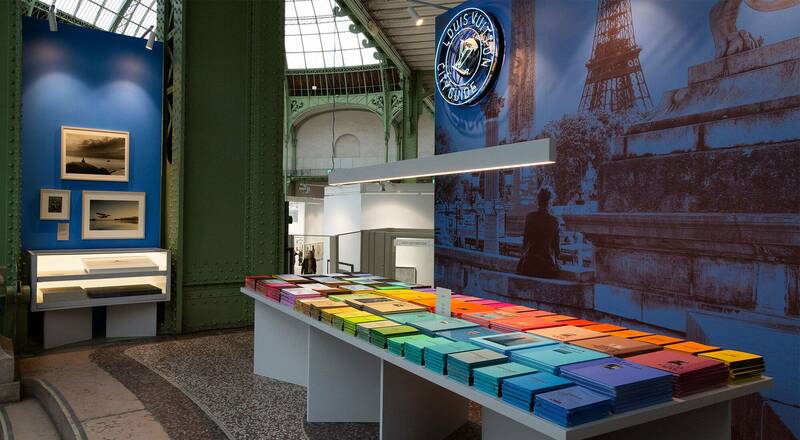 Both the Louis Vuitton City Guides and the Fashion Eye collection of photography books were featured. In the Fashion Eye series, Louis Vuitton presents a city, region or country through the eyes of a fashion photographer. The Louis Vuitton Publishing pop-up store spotlighted five new Fashion Eye books published this year. With its City Guide and Fashion Eye collections, Louis Vuitton Publishing explores creative photography while celebrating the art of travel. The photos that illustrate the Louis Vuitton City Guides are shot by the photography collective Tendance Floue, heightening the distinctive perspectives of different cities proposed in these exceptional books. For the 2019 Paris City Guide, the photos were shot by Patrick Tourneboeuf, and photographer Françoise Huguier shares some of her favorite addresses. During Paris Photo 2018, visitors had a chance to browse through the digital version of the guide, which was available free from the Apple Store. Because travel is part of Louis Vuitton’s DNA, the Maison took advantage of the fair to present the five latest additions to its prestigious Fashion Eye collection, which spans a vast diversity of personal visions, from urban panoramas and natural landscapes to scenes of local life and more contemplative photographs. These new tomes invite readers to Bali, Iran, the Silk Road, Cretto di Burri in Sicily and Geneva as seen through the lenses of photographers Quentin de Briey, Harley Weir, Kishin Shinoyama, Oliviero Toscani and Paul Rousteau. On November 9th and 10th several photographers from the collection (Kourtney Roy, Harley Weir, Kishin Shinoyama, Vincent van de Wijingaard, Quentin de Briey, Paul Rousteau and Oliviero Toscani) were on hand to sign their books at the Louis Vuitton pop-up bookstore at the foot of the Stairway of Honor in the Nave of the Grand Palais.